A pizza party is perfect any time of year and for any single reason, whether it’s a birthday, graduation, or just because you felt like having friends and family over for some fun. If you’re getting ready to throw a pizza party, you may be seeking out some entertainment. If you’re looking to do something more than just watching a movie at your next pizza party, here are a few games and activities that can keep everyone entertained. Along with regular board games, try to find some that are pizza-related like the spin a slice pizza game or pizza dicecapades. This is both a great activity for kids and adults. Even if you’re opting to order from Hungry Howie’s instead of making your own pizza, apron design is a fun way to keep guests entertained while you wait for your pizza. Find some inexpensive plain aprons; buy fabric paint, stencils, markers, and glitter (if you’re up for the challenge of cleaning up excess glitter for weeks after the festivities). If you plan on providing the main course, have guests whip up dessert. Look up some recipes for dessert pizzas featuring chocolate, fruits, and other sweets. Choose recipes that don’t require baking for easy and quick desserts that can be enjoyed after lunch or dinner. Another great party game that would be just as fun for kids as it would be for adults: purchase empty mini pizza boxes or see if your favorite pizza place will let you have a few free boxes. Leave the boxes unassembled and have a race to see who can assemble the boxes the fastest. Give out small prizes to up the ante. Take the top of your favorite pizza box and cut it into several small to medium sized pieces. Mix the pieces up and have guests assemble the box top. If you’re feeling competitive, cut the box up into smaller pieces and have a race to see who can complete the puzzle the fastest. Painting may not exactly be considered a game, but it’s a fun way to entertain. Host a painting party where guests will be led by an instructor on creating a masterpiece they can hang in their own home. “Paint and sip” parties and studios have grown in popularity, so why not host it from the comfort of your own home where you can provide delicious pizza to munch on? 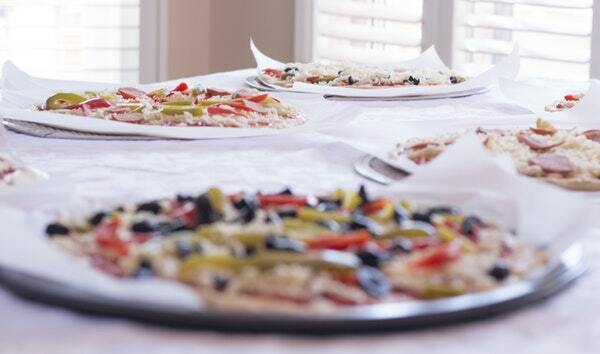 If you’re ready to throw your next pizza party, these are just a few ways to have fun with friends and family.